Facebook answered the big question of whether it’s transitioning to become a mobile ad company by noting in today’s earnings report that 14% of total ad revenue from Q3 2012 came from mobile — about $150 million. The older Sponsored Stories and newer non-social app install and Page ads appear to be gaining traction with advertisers. That number will need to grow significantly in future to keep up with the user shift, as mobile monthlies increased 61% year-over-year to 604 million. Total ad revenue was up 6.7% quarter over quarter and 32% year over year. That’s pretty modest recent growth. Considering Facebook wasn’t even showing ads on mobile until the end of February, the total increase from ads on the small screen could have been stronger. But Facebook only just launched several high-potential mobile money makers. It’s app install ads could become a primary way for developers to get their apps discovered outside of the app stores. They might be willing to pay Facebook a lot for that service. It’s also exploring the operation of an external mobile ad network on other apps and mobile sites, which could help Facebook earn more without showing more ads on its own properties. Those may let Facebook squeeze more money out of smartphone users hungry for apps. Meanwhile, Facebook’s entry into ecommerce, Facebook Gifts, could quickly double the revenue per user for anyone who makes a few purchases a year. However, it has to make gift buying a common habit. It also needs to get Gifts rolled out to its first-world international markets, particularly the UK and Western Europe. That will come with localization and shipping issues to hammer it out. Unfortunately, Gifts, the mobile ad network, and app install ads all leave out the feature phones used to access the service from emerging markets like South America and Africa. Eventually, those users may upgrade to smartphones, but data connections could still be slow or expensive. For the US and Canada where many use smartphones, average revenue per user (ARPU) was up from $3.20 to $3.40 this quarter. 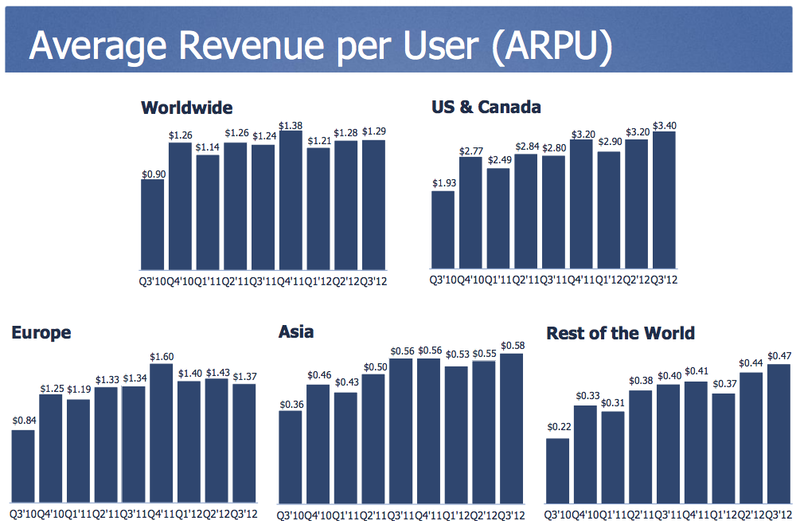 And while the “rest of world” region got a slightly larger percentage increase from $0.44 to $0.47, the ARPU for some of Facebook’s fastest growing markets is still only $0.47. Facebook has to figure out how to get a higher ARPU out of feature phones. The mobile revenue stats released today weren’t as impressive as investors may had hoped, but they’re a decent start.